Result Clothing are a promotional clothing brand founded in 1994 based in Colchester, Essex, UK. A visit to their website reveals that they have a 'Retail' arm that sells advanced outdoor clothing made from advanced esoteric materials under the "Result Performance" brand. Many of the clothing lines are also available through promotional clothing outlets. 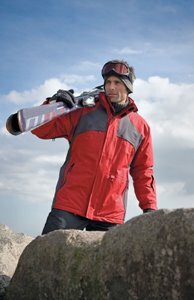 The purchase of clothing that enables the user to yomp up Snowdon in winter is not the focus of all promotional clothing buyers so the range includes more down to earth items such as fleeces, body warmers and workwear. The company has a short statement on "Employment Policy" and "Child Labour" on the trade section of its site. "RESULT requires that all authorised garments baring [sic] its name are manufactured under conditions which adhere to strict standards on working hours and good working conditions including factory temperature." and "RESULT does not permit the use of child labour in any part of their manufacturing process." There is a short statement on equal opportunities. Curiously the Retail section of the site features similar but different statements. On environmental issues the trade section of the site says "RESULT also encourages the use of azo-free dyed fabric where possible" whereas the Retail section says "RESULT Performance prohibits the use of fabrics containing banned amines from certain Azo dyes." While it would be good for all garments to be AZO free, on the Pier32 site you will see many marked as AZO free. In common with other brands, we'd like to see more specific information on the ethical and environmental issues surrounding their clothing on their site. Where is the clothing made? If there are more detailed policies behind the scenes, how are they monitored? Because of the brand name and relatively small size, Result makes it difficult to trace any commentary on their activities on the web. If you know more please let us know be sending an email or leaving a comment. AWDis, "All We Do is Hoodies" or "Just Hoods by AWDis" all are trade names attached to a new company that we have just begun doing business with. And, yes, all they do is hoodies! 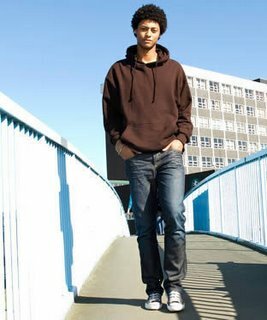 Their website, with an attractive brochure that makes the most of the street culture associated with hoodies (while portraying wearers in a positive light) is justhoods.co.uk. A rich variety of colours are available. One thing that they have not had time to get around to on their website is their ethics. With no mention at all of fair trade, let alone eco-language, we contacted them to find out more. we were pleased with the response. A set of written Business Partner Guidelines cover the expected points - to summarise: "JUST HOODS BY AWDIS's goal is to create and encourage creation of model operations that provide good jobs at fair wages and also improve conditions in their communities"
On the environment "JUST HOODS BY AWDIS will seek business partners who demonstrate a commitment to progressive environmental practices and to preserving the earth's resources". "Products supplied must conform to all European Union environmental legislation". Their products are sourced from a factory in Pakistan. Their cotton "is sourced from ethical cotton suppliers in Pakistan local to the factory". More tangibly, the factory is WRAP (Worldwide Responsible Apparel Production) certified - see website - a monitoring organisation based in the USA. Here it is the factory that is monitored and has obtained certification rather than the company but WRAP (a US based entity) have a thorough approach to their certification and their activities give us some considerable comfort that AWDis - a one product, one factory company - is doing what it can to respond positively to the pressures now on even the smallest clothing companies to ensure that its supplies of hoodies are ethically sourced. Starworld is a very popular choice for the customers of Pier 32 and we have associations with the brand for over 7 years now so we know the quality of the finished t-shirts and other products well and supply it with confidence to our customers. Because we deal direct with the manufacturer, we are able to offer prices which are extremely competitive. Starworld produces its t-shirts and other clothing in Egypt, an African country with a great tradition in cotton production and one of the more Western facing African nations. We publish the ethical statement of Starworld on our site - it's a lot more specific than some of the vaguer statements issued by other manufacturers (who may say that they respect the labour laws of the producer countries and then don't go on to tell you where they are or that they permit 16 hour working days....). The American Chamber of Commerce in Egypt publish a summary of Egyptian labour law and it's easy to see how it fits in with the Starworld statement. Indeed it's quite close in many aspects to European labour law. We like the fact that Starworld are not very good at glossy websites and brochures. It is very evident that money is spent on other things! We also like that Starworld t-shirts are produced within the Oeko-Tex 100 standard - which means that production is carried out in such a way that the final product is free of any toxic substances. Digging for dirt found a recent debate at York University on whether it was possible at all to find a supplier that could provide t-shirts in an ethical way and at an appropriate price. It seems that the University Student Union did not have to change its ethical merchandising policy (which was being actively discussed) because Starworld met their stringent cost criteria. What is fair trade? Or Fair Trade? Or Fairtrade? An interesting read is a new article published at the NewConsumer.com website asking how aware the public might be about "what Fair Trade is"? The article consistently capitalises Fair Trade - giving it the feel of something that is definite, defined, but I think the reason for this capitalisation in the article is because it's applied to Fair Trade in the context of IFAT - the global network of Fair Trade Organizations. Just as the Fairtrade Foundation certifies PRODUCTS for the UK market, IFAT certifies businesses (such as Divine Chocolate) and organisations (such as Oxfam UK). The message in the article is that Fair Trade can apply and be certified in respect of the purchase of raw and close-to-raw materials but not after there has been any degree of manufacturing. So neither IFAT or the Fairtrade Foundation certify manufactured clothing. Fair Trade clothing does not exist. Let's talk about fair trade. Yes we, and many companies like Pier 32, continue talk about fair trade because it is a concept that people can relate to - a phrase for us that means we care who we buy from and we'd like you to too. Whether it's Starworld in Egypt because of our close ties, Continental for their organic products, Wombat for their Fairtrade certified cotton, Adidas for its extensive and transparent monitoring programme, Gildan for its Fair Labor Association accreditation; all we can do is try and be as upfront as possible in sharing what we know. This information is largely shared in this blog - it can help you decide by your own fair trade standards what fair trade is and what you should buy.